I started the day with a sewing project. For me, this is not done lightly. My expertise with the needle leaves much to be desired so I usually bring clothes that need repairs to a professional seamstress. But this was an emergency. Tonight we are going to an event that requires dressier clothes, the kind I only wear once or twice a year. My project is a black sleeveless top that I had bought on sale a year ago. But when I tried it on at home, I realized it was almost a size too big on me. I couldn't return it so it had hung in my closet all this time, waiting for me to decide whether to donate it to Goodwill or bring it to a seamstress for repair (which would cost more than the top had cost). So I decided to give it my "quick" treatment. 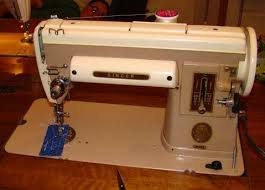 I still remember my first sewing project. I was in my first year of high school and all the girls had to take cooking for half the school year and sewing for the second half. The boys took wood working which I would have preferred; however, this was 1955 and the women's liberation movement was still 15 years away. I breezed through cooking; something I had done a lot of at home but the sewing class literally tied me up in knots! The first project for the class was an apron. We chose our material, then learned how to cut out a pattern, thread a needle and make small, neat strokes through the fabric as we sewed it together. I struggled with each step, watching as my classmates completed their aprons and moved on to a skirt. I can't remember if I ever finished the apron but I did learn to hate sewing and promised myself that I would avoid it at all costs. 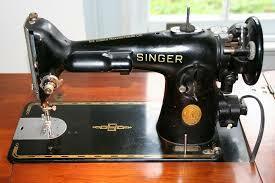 However, I was enticed back when I inherited my grandmother's treadle sewing machine. We didn't have Barbie dolls in those days and I wanted to dress a favorite doll in grown-up clothes. I searched for bits of material around the house and designed some kind of outfit for the doll. After some experimenting, I learned to use the old machine. 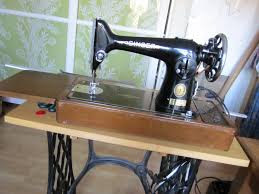 I loved the feel of the treadle, peddling it back and forth with my feet while my hands maneuvered cloth through the needle. The clothes I made had a short life span but I learned that sewing could be fun if I could choose the project. 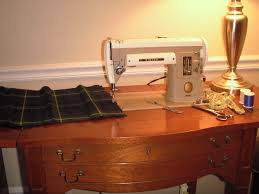 My mother had taken sewing lessons at one point but the table sewing machine she had bought was soon tucked away in its case and stored in the back of the closet. The sewing projects stopped with the class and my mother was reticent to get rid of such an expensive purchase. When I got married, she saw the perfect home for the sewing machine and sent it to me. I ignored it until early in my first pregnancy when I thought I could save money by making a few maternity clothes. I bought a pattern, material and thread and went to work. My project was a two piece outfit; a skirt and long top. I tried to follow the pattern, cutting a hole in the front of skirt to accommodate the baby's growth. I think I wore it once or twice but by the time I was five or six months pregnant, I discovered that the hole in the skirt came down too far and the jacket was too short, exposing my pregnant belly to the world. Those were the last clothes I ever made. But I did get into other projects. Years later, with three growing children, I felt the need for an art project. I decided to make quilts for my daughters' beds. Out came the same old sewing machine, still in pristine condition after years of abandonment. I bought four colorful sheets, cut them in squares and sewed the squares together; then backed them with a soft, fuzzy material and filled the interior with stuffing. Then I repeated the process for our second daughter. For a month, our dining room table was covered with fabric, thread, and stuffing - all presided over by the old table sewing machine. Because the kids took so much time during the day, I stayed up late into the night, obsessively working on the projects. When both quilts were done and spread out on the girls' beds, the sewing machine went back in its case and retired to its home in the storage closet. Since that time, I have sewed hems and pant cuffs (simple ones that only have to be turned over), a few buttons, the occasional ripped shirt or pants, and immediate projects like the one today. I hadn't done much sewing for some time until my granddaughter asked me to teach her how to sew. When we visited a few months ago, I brought a book on learning to sew for children and a small sewing basket filled with all the necessities. She and I spent most of one day working on a small stuffed dog (or cat or bear; I was never certain). She tackled the project with determination and did most of the work herself. However, she had energy to burn when we finished and I was exhausted, ready to go to bed! But it was great fun and exactly what I always thought being a grandma was all about. The sleeveless top I worked on today was too long, both in the shoulders and in the length. So I pulled up the shoulders, folding the fabric over until the neckline hit me where it was supposed to. Then I pinned it and did the same on the length, folding the hem up until it hit my hips. A search through my sewing kit proved that I had every possible color of thread except black. I called a neighbor and an hour later, I had a spool of black thread! The finished project was very imperfect - lumpy shoulders and bulky hem - but it won't be obvious when it's hidden under a jacket. Another sewing project, another day!